The author of the New York Times bestselling books The Lacuna, Flight Behavior, and The Poisonwood Bible Barbara Kingsolver returns with a novel that interweaves the past and present. 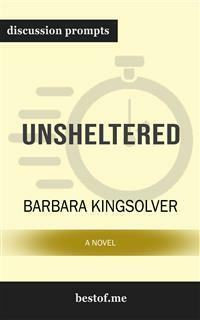 In Unsheltered, Kingsolver explores the human capacity for compassion and resilience in the midst of upheaval. Unsheltered is the timely novel about the story of two families in two centuries. They lived in New Jersey, at the corner of Sixth and Plum in Vineland. They navigated what seemed to be the end of the world as they had known it. With history as their backdrop, Kingsolver’s characters paint a startlingly relevant portrait of life during precarious times that the foundations of the past have failed to prepare everyone for the future. In this comprehensive look into Unsheltered: A Novel by Barbara Kingsolver, you'll gain insight with this essential resource as a guide to aid your discussions. Be prepared to lead with the following: Discussion aid which includes a wealth of prompts and information Overall plot synopsis and author biography Thought-provoking discussion questions for a deeper examination Creative exercises to foster alternate “if this was you” discussions And more! Disclaimer: This is a companion guide based on the work Unsheltered: A Novel by Barbara Kingsolver and is not affiliated to the original work or author in any way. It does not contain any text of the original work. If you haven’t purchased the original work, we encourage you to do so first. Have you ever wanted to improve your understanding of Unsheltered: A Novel? Or perhaps you are simply struggling to learn the subject matter? It’s a simple teaching technique that helps students learn and readers to grow. With versatile discussion questions for each major criteria regarding Unsheltered: A Novel, this discussion prompts are designed to help crucial surface discussions that are capable of assisting toward thinking and learning on a deeper level.